I’ve got good news, bad news, and terrible, horrible, no good, very bad news. My question: Why do “reformers” think that we need to “standarize” kids? The kids and grandkids in our family are not the least bit standardized; they are each very unique individuals. I bet your family is the same. The good news is that most of the public now realizes that standardized tests might not be all that they were cracked up to be, as NCLB and Rttt (Race To The Top) tried to make us believe. In fact, those tests were really about one publisher making a lot of money off the backs of districts struggling with fewer dollars…not to mention, off the backs of struggling students, who often begin to believe they are stupid. Let’s be clear: The tests are stupid; the kids are smart. The bad news is that these tests are no longer going to be mandated by the feds. Sadly, many states have bought into the existing myth that standardized tests are good. So, in many places the mandated tests continue. The dollars keep rolling into the publisher. In addition, we have even bigger bad news: Even if standarized tests go away, they will be replaced by a new myth, ‘personalized learning.’ Sounds good, doesn’t it? Do not be fooled. Personalized learning is nothing more than a new superhighway to standardizing kids through mandated modules and daily testing; it will also be called competency-based education (CBE)…just to keep us confused. Our new national education policy (ESSA) supports this approach to testing, as does the National Governors Association, even though they have admitted that there is no evidence supporting this major shift. Computer companies, publishers win again; kids, families, and districts lose again. And after all of this money is spent on personalized learning/CBE, I guarantee that my kids and grands will still not be standardized. 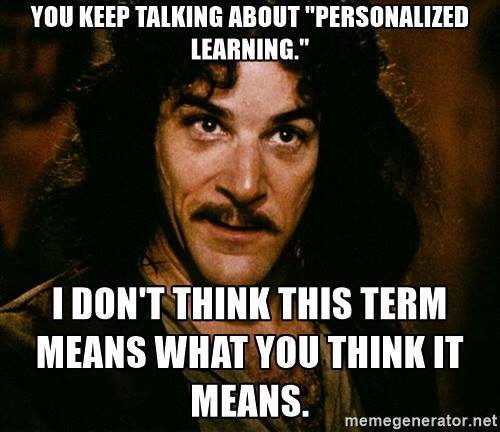 For more on this, read Personalized: What does it mean? by Steve Krashen. He also posted this information Facebook. And, now for the really terrible, horrible, no good, very bad news: The corporate take-over of public education is not only in the U.S., but is really a world-wide plan to take over education. The following is one example. Thank you, Steve, Diane, and Anya: You are such handy research assistants. Do you really want to support kids in your local schools? Please go sit with kids on a regular basis, listen to them, know them, and read to them. You could start with: Alexander and the Terrible, Horrible, No Good, Very Bad Day by Judith Viorst. I have spent the last eighteen years in education( my third career) and have watched as we have done more and more testing, most recently two weeks worth in grades 3-5. Some students do fairly well in the test environment(all on-line on the computer) but many at 3rd and 4th grade do not have the keyboarding skills necessary to navigate through the test for sections requiring six hours or more hours of test time. ( talk about rigor!) Secondly, after spreading the sections out over two weeks to give the students the best chance of test success, many kids burn out after several days, resulting in poor or even worse non-representative test results, the state and Fed ( Title I) use as a part of funding.